Mitt Romney, who claims that he accepts the long form Hawaii Birth Certificate that Barack Obama released to the media some while ago, nevertheless has embraced Donald Trump who is militantly claiming that Mr. Obama is an ineligible foreign-born illegal president. 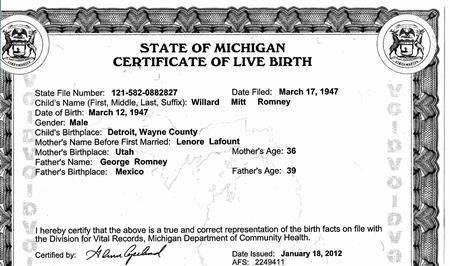 And as if taking up the birther cry himself, Romney unexpectedly released his own birth certificate, with one resulting revelation that may ironically sink the whole birther farce altogether. 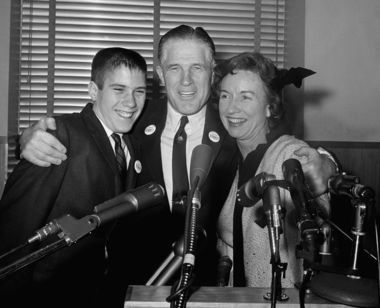 Mitt's birth certificate lists his father's birthplace as Mexico and has revived the question of George Romney's eligibility to run for president, which he did in the late 1960s. Questions were occasionally asked about Romney's eligibility to run for President due to his birth in Mexico, given the ambiguity in the United States Constitution over the phrase "natural-born citizen". His Mormon paternal grandfather and his three wives had fled to Mexico in 1886, but none of them ever relinquished U.S. citizenship. While the Constitution requires that a president must be a natural-born citizen, the first Congress of the United States in 1790 passed legislation stating: "The children of citizens of the United States that may be born beyond the sea, or outside the limits of the United States, shall be considered as natural-born citizens of the United States." Romney and his family fled Mexico in 1912 during the Mexican Revolution. During the campaign, Romney was generally considered a viable and legal candidate for United States president. He departed the race before the matter could be more definitively resolved, although the preponderance of opinion since then has been that he was eligible. As early as 1967, Democratic members of Congress were questioning whether George Romney was eligible to run for president, leading to numerous legal arguments which concluded that Romney—whose parents were American citizens who moved to a polygamous Mormon colony in Mexico—was indeed a "natural born citizen." The Congressional Research Service issued a paper saying the legal meaning of natural born citizen "most likely" included anybody born out of the US with at least one parent who was an American citizen. The elder Romney's own take, via a written statement from his records: "I am a natural born citizen. My parents were American citizens. I was a citizen at birth." Not both parents, but at least one parent. As that statement came from Congress's own research department, it would undermine the birthers' tiresome campaign. Barack Obama's mother was an American citizen, and it wouldn't matter whether he was born in Hawaii or not given Congress's 1790 legislation that birth on U.S. soil wasn't necessary anyway. Now to everyone out there (Mr. Trump) who insists on beating an obviously dead horse, could we all please get working on real problems that need real solutions? It's almost incomprehensible that this is still going on. I realize that prejudice and racism are on the rise in this country, and will probably get a lot uglier before the pendulum swings the other way. But I still find it unreal and very dangerous. I view Facebook as a tool that, like any tool, can be used or misused. I choose to use it for keeping in touch with people I care about -- family, friends, colleagues both former and current, and internet friends I initially encountered through their blogs. Blogging and Facebook have brought me together with people, many of whom I value deeply as essential in my life; in other words I have used Facebook to enliven, enrich and increase my community. As to privacy, one can control what one decides to reveal. I really don't understand such blanket condemnation as CNN's. Apparently, they deny that we have any discretion or control over our own lives. Our goldfinch couple in the seed feeder. They always enter the feeder facing away from each other and maintain that pose until they fly out together. I'm told I should hate chipmunks but it isn't happening. The ones we have here have not damaged anything as far as we can see, and they happily inhabit the rock walls I constructed all over the property. I wasn't mad for this one making repeated visits to the seed feeder and filling his cheeks with sunflower seed hearts, however, so I greased the pole with Crisco and haven't seen him in there since. Last Thursday, all the roses opened at once! I don't do facebook, so maybe I shouldn't even comment. But that has not kept me from opening my mouth before.... I think it is a useful tool for people who use it the way you do, but I worry about kids with no supervision who use it, give out way too much information, and then either have conflict with friends over it, or worse. Everyone isn't as responsible and reasonable as you are. I don't use it because A. I don't have time for another social media method and B. I'm not sure I trust the confidentiality implied, because, as you know I work with high school students, and several of them have gotten in trouble for hacking into things that are none of their business. and C. I already get invitations to be friends with people on Facebook I don't even know, and can only imagine that would increase if I actually belonged. And I don't need that extra mail to delete. I miss feeding the birds; I used to do this all the time. I love "Romney's paternal grandfather and his three wives had fled to Mexico." Once again proving that marriage has ALWAYS been between one man and one woman. And one woman. And one woman. Since I have nothing to add to your spot-on commentary (and wcs's hilarious comment), I will just say I love your photos and I know a lot of couples (like your goldfinches) who have the same approach to their meals together. Not much to add here, either, Will. I don't use Facebook and won't because I don't trust it. I hadn't known about that 1790 legislation, though, so thank you far that; it really does put paid to the whole birther nonsense. Lastly, I can't believe that your astilbe's are in bloom already. Our spring is early but we're not at that stage yet.